Darrell has one Album entitled PLEASE DON'T KILL ME AGAIN and is currently working on his second MEDITATIONS IN THE PSALMS. You can listen to his latest single Jeannette's Song here. Pastor Hansen wanted to release two of his latest songs for your listening pleasure. They can be downloaded here. Donations can be made for Jeannette's medical bills using any of the options below . Hospital bills for Jeannette's treatment are right at $20,000. Please, if God has prospered you, and you are able, it would be a huge blessing to remove even some of this financial burden for Pastor Hansen and his family. 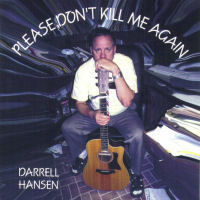 For a donation of $15.00 or more we will send you a copy of Pastor Hansen's cd entitled "Please Don't Kill Me Again". I promise the music will bless your heart. Thank you and God bless!
. ::PLEASE DON'T KILL ME AGAIN::. Enjoy this sample, "As The Hart Panteth" (Psalm 42), from the new cd project entitled "Meditations In The Psalms". This project will consist exclusively of Psalms taken from the KJV and set to beautiful music making it an entertaining and fun thing to memorize Bible scripture. Scripture memorizing cards will also be available as an aid to reinforce the music. "Thy word have I hid in mine heart, that I might not sin against thee" Psalm 119:11. In a day were temptation and sin run rampant, Christians need all the spiritual food they can get. Listen to this cd as you travel in your car. Walking or working, or for meditation in your personal devotions. As the word of God is timeless, so are these scripture songs. Purchase the corresponding song book and use the music for your youth group. The target date for finishing this project is April 2006 so be watching for it. God bless! This is a sample from his latest project he is hoping to finish in early 2007. "I�ll Be Home By Spring" was inspired by an actual event that was relayed to him through his son in the USAF. It is about a young man leaving his family to go to Iraq. Every time you listen to it, your hair stands up on the back of your neck. Simply a beautiful song! "Violent Man" was written from Psalm 140. As is the case much of the time with the Bible, it is relevant for us today. Pastor Hansen added a little Spanish guitar. He has been described by his studio engineer as a "wild man" on the guitar. A little of that can be experienced here. He has been playing guitar since he was 13 years old. He just seems to get better as the years go by. God bless you! Enjoy these free samples. Maybe you can show your appreciation by purchasing Pastor Hansen�s new album when it is released. In doing so, you can support the ministry at BCBC.